We apologise for the delayed arrival of today's Bringing up Charlie review round-up. This is due to unforeseen consequences of a splendid evening entertaining friends (eating, drinking and generally merry-making) until the wee small hours and the subsequent loss of normal service to the editor of this rubbish, i.e. me. In other words, I was hung over. Rather badly. 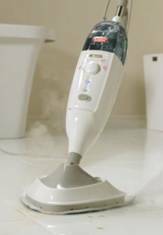 But I'm better now and just in time to tell you about some fantastic products I've been asked to feature, starting with something every household needs after a dinner party - a steam mop. Not that our guests were messy, you understand. But, well... a day of cooking followed by an evening's entertaining and increasing inebriation inevitably leads to the odd spill. Which is where the new Hard Floor Advance+ steam mop from Vax comes in handy. It heats up in seconds and leaves floors so sparkling clean and fresh you’ll never want to use a conventional mop again. Not that I ever did. Seriously, mopping floors is just, well... so tedious. The nearest I ever get (or should I say, the nearest I ever got) was attaching a couple of old dishcloths to my slippers and sliding about on the tiles. (It was either that or getting down on my hands an knees.) But now, with my new Hard Floor Advance+ (which combines the triple cleaning action of hot steam, citrus-fresh detergent and a compact scrub brush head to tackle stubborn spots and stains) I'm a new man. And our kitchen has a new floor. Or at least, a new colour now we can see the tiles. The Vax S3S+ Hard Floor Advance+ is available from all major retailers and direct from Vax.co.uk at RRP £99.99. Old dishcloths for attachment to feet thereof are available from me, free. Next, car seats. I can't think of a way of segueing from steam mops to the child car seats so I'm not going to. But a new Group 2/3 seat from Britax called the KIDFIX XP SICT certainly takes safety to a whole new level. Designed for children aged 4-12 years it boasts a fantastic new cushioned seat belt pad which reduces high neck loads by 30% and takes crash forces away from the chest area. It also protects a child in the event of a side impact collision with adjustable side impact cushion technology (SICT). Once children reach an age when they can safely and legally use a booster or some other kind of seat which utilises the car's own safety harness there's a danger of assuming they're as protected as they need to be. This new seat ups the ante considerably. It's out now and retails at £165. Finally, what do you do when the weather outside is frightful and you're still some way off fully recovering from the night before and the kids are about the start climbing the walls? Well, a couple of new products from LeapFrog have kept my two entertained - and educated - this weekend and they're well worth a mention. Charlie's a long-established fan of LeapFrog. His LeapPad goes with him everywhere and (see this post) certainly made long car journeys bearable this summer. Now he's been sent a wonderful new Tag Reader to play with. I say 'play' but, in fact, the Tag Reader is an entire educational phenomenon encouraging reading, writing and learning on a whole host of levels. Charlie loves it. Eloise is rather young for it, though. But not to be left out the lovely LeapFrog team has sent her a wonderful cyber pet (I can think of no other more apt description) - the lovely Leapfrog Violet - which not only provides her with something to cuddle up to, but something which sings songs to her, reads her stories and starts some basic word recognition with her, too.